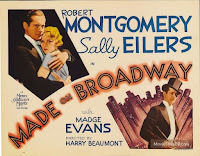 Two of the eight films included in Robert Montgomery’s four-disc Warner Archive Collection set – including 1931’s The Man in Possession and 1933’s Made on Broadway – offer fans of the actor an opportunity to explore his comedic side as he rose to prominence on the MGM lot and eventually branched out to darker material as both a director and star. 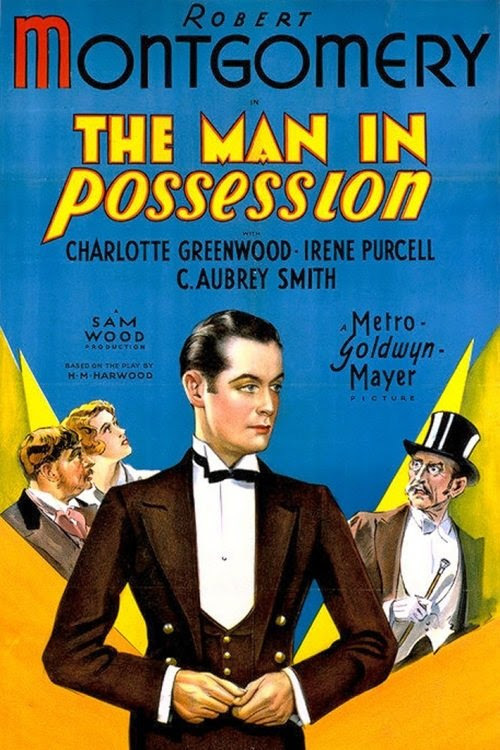 Essentially a drawing room farce of mistaken identities and withheld information, The Man in Possession finds Robert Montgomery at his most William Powell-like. To the credit of screenwriters Sarah Y. Mason and P.G. Wodehouse, H.M. Harwood’s eponymous stage play is fairly easy to follow in spite of its increasingly convoluted storyline which finds ex-con turned bailiff’s assistant Montgomery asked to play the part of a fake butler (all the while requiring you to suspend your disbelief even more than usual). Left to “take possession” of a property overnight until the bailiff returns to retrieve a debt owed by a scheming beauty played by Irene Purcell, Montgomery agrees to pose as her butler during an all-important first dinner with her future in-laws. Stunned to discover that the surprise guests are his very own family who (with the exception of his adoring mother) are too embarrassed to identify the servant as her beau's black sheep brother, things get increasingly awkward as the night goes on and Montgomery begins falling for his brother’s girl. As affable as the picture is, the chemistry between Montgomery and the otherwise capable Irene Purcell just doesn’t have the same electric spark that he’d exhibited with other leading ladies of the era including Myrna Loy in When Ladies Meet, Norma Shearer in Private Lives, Rosalind Russell in the underrated Fast and Loose, and Carole Lombard in Mr. and Mrs. Smith. Nonetheless, Purcell’s sexually liberated Pre-Code turn helped establish both costar Montgomery as a viable romantic lead and also pave the way for the success of other daring '30s actresses such as Jean Harlow, who stepped into the exact same role in her last screen performance via the more popular 1937 remake of Man in Possession dubbed Private Property. Less charmingly frantic than it is merely frantic and occasionally charming, the generically titled Made on Broadway might just as well have been called "Sixty-Eight Minutes in Search of a Plot." Although on the surface it's a comedy of remarriage that’s packed with the same battle-of-the-sexes style barbs that were commonplace in other Pre-Code era titles, unfortunately besides a terrific turn by Robert Montgomery as an ace press agent who can spin any situation – including cold blooded murder – to his clients’ advantage, there's not a whole lot holding director Harry Beaumont’s weak 1933 offering together. 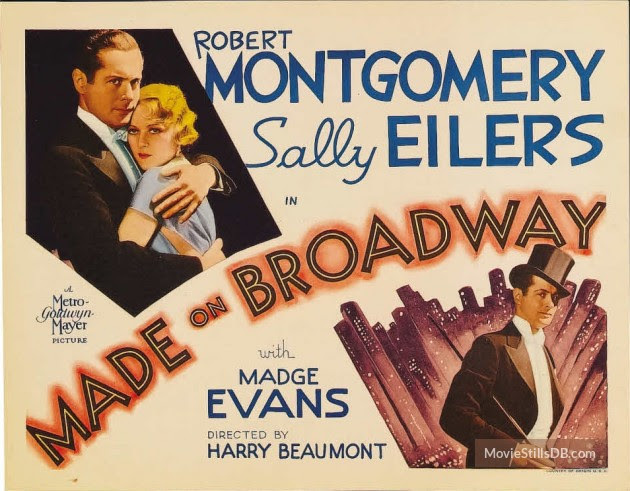 Most intriguing as a darkly comedic tale of one-upmanship between Montgomery and Sally Eilers sandwiched between a stagey exposition filled beginning and a melodramatic penultimate act (with a courtroom trial no less! ), the oddly structured Broadway makes its way through a myriad of other tones and genres before ending things on a predictably happy if sappy note. Part love triangle, part mystery, and filled to the brim with characters that are only in a single scene, there's enough going on throughout that similar to The Man in Possession, Made on Broadway could definitely inspire a remake or several... depending on just how many of its many incomplete stories that future filmmakers wish to tell. Text ©2016, Film Intuition, LLC; All Rights Reserved. http://www.filmintuition.com Unauthorized Reproduction or Publication Elsewhere is Strictly Prohibited and in violation of the Digital Millennium Copyright Act. FTC Disclosure: Per standard professional practice, I may have received a review copy of this title in order to voluntarily decide to evaluate it for my readers, which had no impact whatsoever on whether or not it received a favorable or unfavorable critique.